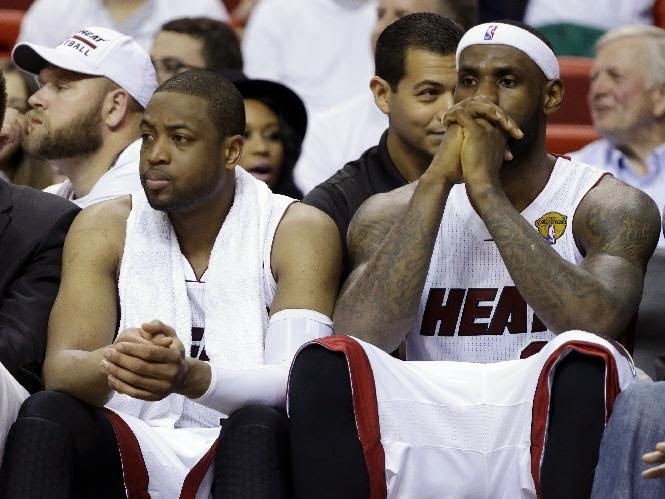 MIAMI – LeBron James and the Miami Heat have worked a miracle in the NBA Finals before. The Heat, however, will need to accomplish something even more miraculous to win a title again by way of the grandest comeback in the Finals, a history dating back to 1950. The Heat fell one loss shy of elimination in the Finals to the San Antonio Spurs after a107-86 loss in Game 4 on Thursday night. "We put ourselves in position where it is about making history," James said after the defeat, the Heat's second straight blowout to the Spurs. Miami needs three straight victories to earn a three-peat championship. Two of those games would be in San Antonio, beginning with Game 5 on Sunday. The Spurs are 10-2 in San Antonio this postseason with the last loss coming against the Heat in Game 2. No NBA Finals team has come back from a 3-1 deficit since the championship series began 64 years ago. Ever. Only eight teams have come back to win a playoff series after falling behind 3-1. The last to accomplish the feat was the Phoenix Suns against the Los Angeles Lakersin 2006 during Round 1 of the Western Conference playoffs. "I do know the numbers," James said. "It's never been done before. But we're still a confident bunch." With Michael Jordan in mind, Hall of Famer Charles Barkley is familiar with the unconquered challenge the Heat are facing. Back in 1993, Barkley and the Phoenix Suns were down 3-1 to Jordan and the Chicago Bulls. The Suns won Game 5 in Chicago 108-98 to keep the series alive. But the Bulls won the championship the following game in Phoenix. "Daunting? They have to win two games in San Antonio," Barkley said. "That's over daunting. Daunting is not the right word. The right word is impossible. I don't see them coming back. The reason I don't think they have a chance is because these games haven't been close. "It ain't like there have been one or two plays where you say the Heat can make an adjustment here or there. They have been beaten at home soundly." The Heat's three losses have come by an average of 18.3 points, although Game 1 James suffered leg cramps before the Spurs went on a massive run. Nobody other than James is playing better than average for the Heat. While the spotlight will be on James to put on a Superman cape to save his Heat, the four-time NBA Most Valuable Player knows he needs help. Heat coach Erik Spoelstra replaced forward Rashard Lewis with guard Ray Allen at the start of the second half with the Spurs up 55-36. Allen responded with two points. Struggling point guard Mario Chalmers has scored 13 total points in the Finals. Barkley noted the Spurs' size has taken its toll on the Heat as well. With the Heat struggling with scoring, should they activate offensive-minded forward Michael Beasley, too? Desperate times often lead to desperate new lineups. Spoelstra might be one of those desperate coaches after he takes a deep breath. "We'll look at everything right now," Spoelstra said. "But I'm going to take a step back, exhale. I've got to find a way to do a better job for my group." Don't expect the Spurs to relax for a second considering how the championship trophy slipped out of their hands last year. While it won't be easy to end it, the Spurs are using the Game 6 collapse from a year ago – surrendering a 94-89 lead with 28 seconds left – as motivation and a reminder not to allow another Ray Allen miracle to happen again. 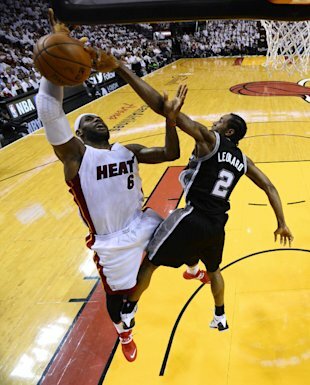 "We have a lot of respect for Miami," Spurs guard Tony Parker said. "They're the two-time [defending] champs. They're a great team and there is still one more game. We have to win one more game. "So we just have to stay focused and we'll be ready. We just have to think about last year. We don't need more motivation than that." Yes, more than a daunting task for the Heat.